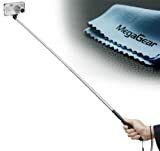 MegaGear Extendable Telescopic Handheld Pole Arm Monopod For Digital Camera DV Camcorder (UPC 028672140299) is sold at the following online stores. We've find the latest prices so you can compare prices and save money when making your purchases online. Please click on the links below to browse to each store's webpage.